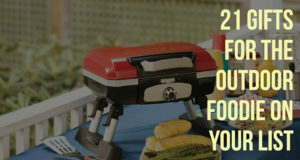 A weekend of camping doesn’t have to mean a complete derailment of those healthy eating habits you’ve mastered at home. Ok, you can sneak a cookie or two we won’t tell, but the main meals can remain wholesome and healthy – and we’re here to help you accomplish that. 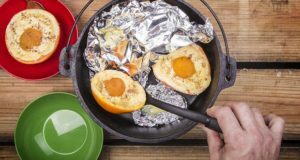 An alternative to s’mores and hot dogs, these 4 healthy camping meals will be so delicious you won’t even know you’re eating healthy. There is nothing better to get your day started than a protein packed breakfast. A colorful display of veggies gives this dish a fun look that even kids can get in to. 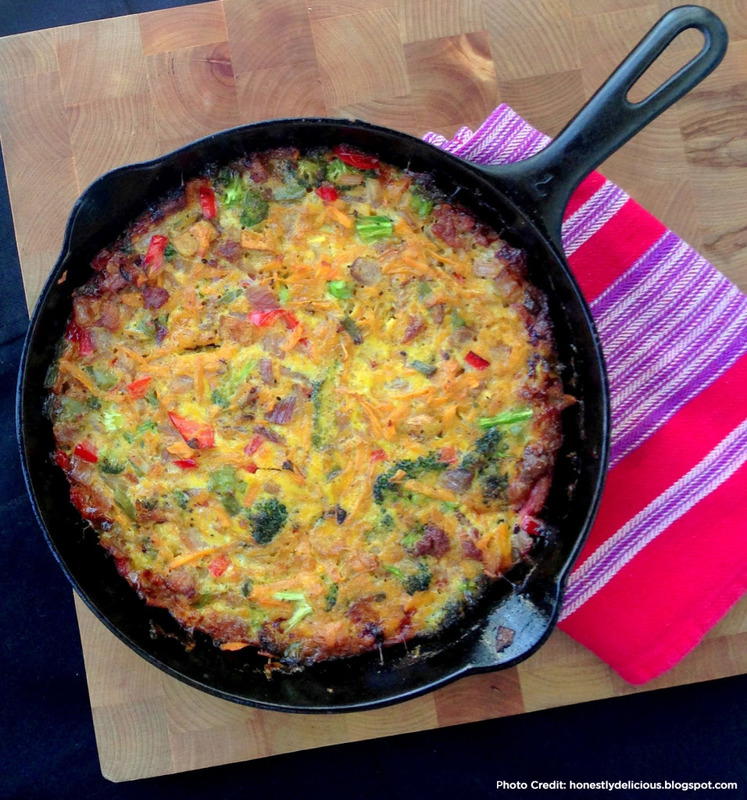 Loaded with peppers, squash, broccoli and onion this frittata only gets better with the addition of lean ground sausage. It’s a hearty, easy to make breakfast with all the good kind of fat that will give you the energy to play outdoors all day. 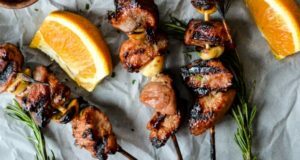 We originally found this on Honestly Delicious and have made just a few tweaks to make it camping friendly, although our recipe is no longer paleo compliant. Brown the sausage in a medium sized cast iron pan. 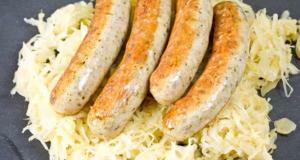 Once cooked, remove the sausage from the pan and reserve to a large bowl, but leave the grease in the pan. Next, sauté the onions, peppers, squash, and broccoli in the same pan over medium high heat for about 5-10 minutes until they are softened. Season them with a pinch of salt and pepper to help flavor them. Remove them and add to the same bowl as your cooked sausage. In a separate bowl, whisk together the eggs, ½ teaspoon of salt, large pinch of fresh ground pepper, paprika, and garlic powder. Add the cooked veggies and sausage to the bowl. Making sure the pan is well oiled, cook the egg and veggie mixture in the pan on low for 5-7 minutes or until the eggs are firm and set on top. A sandwich is a lunch standard. But it can get boring, fast. 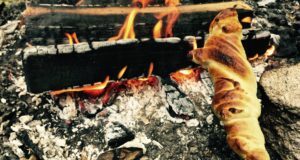 This campfire sandwich looks to kick up the flavors with a toasty sandwich filled with your favorite things. This sandwich gives you options, and lets face it we all love options. We’d suggest picking up some good bread, spinach, basil, tomatoes and mustard. From there let your imagination run wild. Pack on your favorite meat, cheese and veggies. 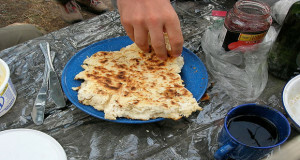 To get it nice and toasty just baste the bread with olive oil and wrap the sandwich in tin foil. Let the fire do the rest. This idea hit us, after reading the Never Home Maker blog – they’ve got some great ideas! Take your slices of bread and spray (or spread) both sides lightly with oil. You can use butter if you would like. Place one slice on the aluminum foil. 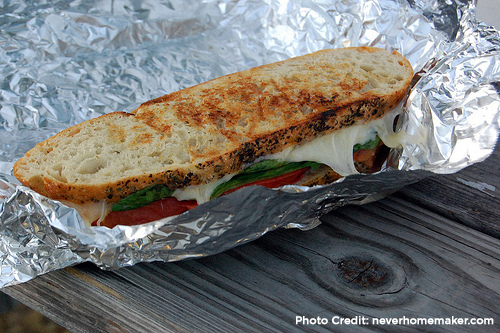 Pile on your ingredients, top with other oiled bread and roll your sandwich snuggly in the tin foil. Toss into the coals of the fire. Cook for 3-4 minutes, check it and flip. You may need to do this a few times. It can burn quickly so be careful! 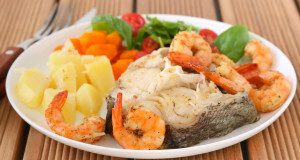 Who knew eating healthy could be easy and delicious! We have a thing for Mexican food – it’s kind of an obsession. So when camping we usually try to make a Mexican dish, but to be honest it’s usually filled with not so healthy things. 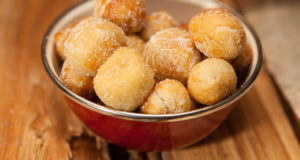 They’re delicious but not healthy. 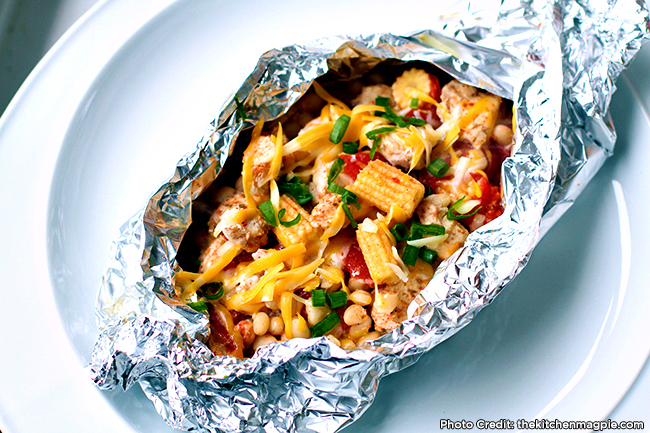 This Tex Mex Foil Packet would rate pretty high on the healthy scale. With veggies and chicken and some great Mexican spices this dish is tasty and super easy to make. Feel free to omit the cheese at the end to keep that healthiness going. This recipe has been featured in a few places but we came across through The Kitchen Magpie. We made a few changes to make it a little more fresh, but if you want to use all canned food it is delicious. Chop the tomato, onion and set aside. Also cut the chicken breasts in to 1 inch cubes. 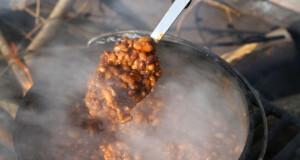 Combine the tomato, onion, navy beans, corn bits, chicken and spices in a bowl and mix well. 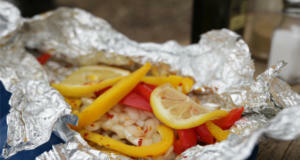 Place ¼ of the mixture on each piece of tin foil, then fold up the tinfoil so that the mixture won't leak while turning the packet over the fire. 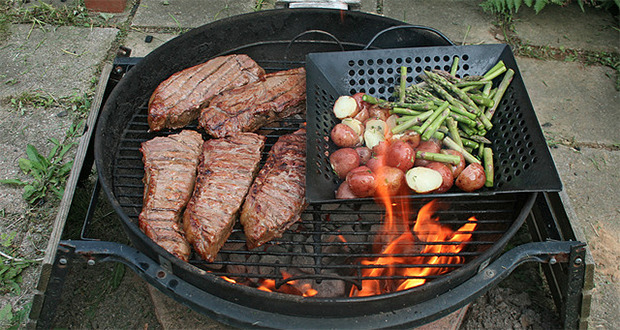 Place on the grate of the campfire or on the grill and cook for 20-25 minutes, turning the packets occasionally so that everything is cooked evenly. When done, remove and open the packet, add cheese (if desired) and green onion. Let the cheese melt for a minute and serve. So how do you go camping and not make a dessert? But if you’re trying to make it a healthy weekend your normal camping desserts like Reese’s Peanut Butter Cup S’mores or Salted Caramel Apple Dips will be frowned upon. But we have a solution – Grilled Pineapple Kebabs. 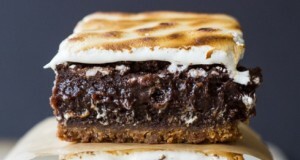 So we’re not claiming it is the healthy dessert in the world it is drizzled with honey and butter but it is a better alternative to the s’more. This delectable dessert is a perfect way to wind down after a day of hitting the trails. Plus it won’t make you feel like your day of adventure was wasted by one calorific dessert. Depending on what type of kebab sticks you are using you may need to soak in water until they no longer float. Only for the wood, metal you're good to go. Cut off the top and bottom of the pineapple and cut lengthwise into eighths. Trim off the core and outside from each eighth. 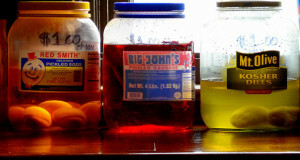 Mix honey, butter, and salt and place pineapple into marinade. Marinate for a half hour. 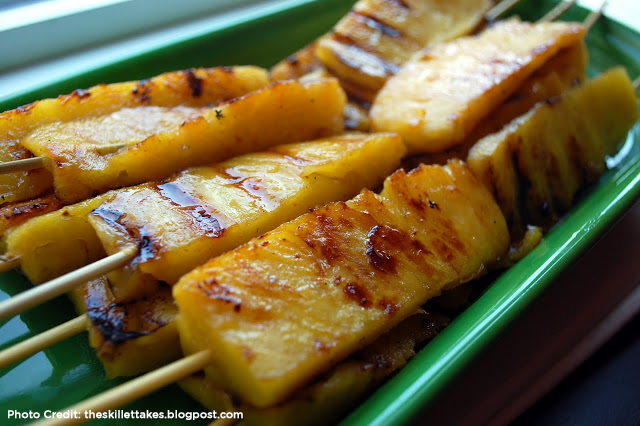 Skewer pineapple eighths with kebab sticks and preheat grill or get campfire grate ready. Grill pineapple for 2 to 3 minutes per side, or until heated through and grill marks appear.